This article is about the general election in the Republic of Ireland. For the assembly election in Northern Ireland, see 2007 Northern Ireland Assembly election. Percentage of seats gained by each of the five biggest parties, and number of seats gained by smaller parties and independents. 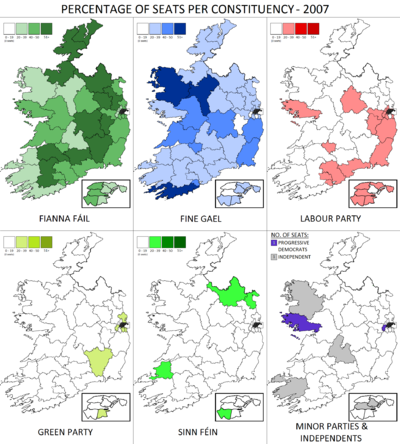 The Irish general election of 2007 took place on 24 May 2007 after the dissolution of the 29th Dáil by the President on 30 April 2007, at the request of the Taoiseach. The electorate was given the task of choosing the members of the 30th Dáil who met on 14 June 2007 to nominate a Taoiseach and ratify the ministers of the Government of the 30th Dáil. While Fine Gael gained 20 seats, Fianna Fáil remained the largest party. The election was considered a success for Fianna Fáil; however, Fianna Fáil's junior coalition partners in the 29th Dáil, the Progressive Democrats, lost six of their eight seats. On 12 June 2007, Fianna Fáil and the Green Party reached agreement on a draft Programme for Government, this was subsequently ratified by the Fianna Fáil parliamentary party and Green Party members on 13 June 2007. This resulted in the formation of a coalition government on 14 June 2007 between Fianna Fáil, the Green Party and the Progressive Democrats. The government was initially supported by four Independent TDs. On 30 April 2007, President Mary McAleese dissolved the 29th Dáil on the request of the Taoiseach, Bertie Ahern. The election date was officially set as 24 May 2007; the 30th Dáil would convene on 14 June 2007 at which stage the Taoiseach would be nominated and the rest of the Government approved for appointment by the President. Official campaigning began as soon as the announcement had been made. Current statute requires that the Dáil be dissolved within five years after its first meeting (6 June 2002) following the previous election and the election must take place not later than thirty days after the dissolution. The Taoiseach extended the life of the 29th Dáil close to a full five years. After the 2002 general election he commented that his prior confirmation of this policy had caused problems in the last year of his government. There was speculation in 2005 that he might have moved to dissolve parliament early to catch the opposition off guard, although this did not transpire. In 2005, in anticipation of the election date, the parties began candidate selections and from mid-2005 some TDs announced their retirement plans. A statement by Minister of State for Children Brian Lenihan in November 2006 suggested that the election would take place in May 2007, as was the case. In December 2006, Bertie Ahern stated unambiguously that the election would take place in summer 2007. There was some controversy over which day of the week the election should have been held on, as some opposition parties insisted that a weekend polling day would have made it easier for those studying or working away from home to vote. Ireland's voter registration process presents difficulties for people who live at a second address for part of the week. Previous elections and referendums have been held on Thursdays, Fridays and (in one case) a Wednesday. For the 2007 election, polling day was a Thursday. The Taoiseach denied that the election was called on Sunday, 29 April 2007 to prevent the Mahon Tribunal recommencing investigations the following day concerning alleged payments to politicians (including Mr. Ahern). Because of the election campaign, the Mahon Tribunal suspended its public hearings on Monday, 30 April 2007 and resumed them four days after the general election on 28 May 2007. The closing time and date for nominations was 12:00 Irish Summer Time on Wednesday, 9 May 2007. Polls were open from 07:30 until 22:30 IST. The system of voting was Proportional Representation with a Single Transferable Vote, also known as PR-STV. The general election took place in 43 parliamentary constituencies throughout Ireland for 165 of the 166 Dáil Éireann seats (the Ceann Comhairle is automatically re-elected). As a result of falling opinion poll ratings for the outgoing government in the months approaching the start of the campaign, the election was one of the more closely fought in decades, with the outcome being very uncertain. This election was fought as a contest for Taoiseach between the outgoing Fianna Fáil–Progressive Democrats coalition and the "Alliance for Change"; a proposed Fine Gael–Labour Party coalition. Opinion polls did not show either option as being certain, and other possibilities include Fianna Fáil-led coalition with other parties, or Fine Gael and the Labour Party with the Green Party. Fine Gael and the Labour Party had an agreed transfer pact. The Green Party was non-aligned but made statements favouring a change from the outgoing Government. All parties, with the exception of the Green Party, claimed that they would not include Sinn Féin in a new Government. Due to the run-up of the Dáil to the maximum allowable life-span, it was clear to all parties that the election would be held early summer 2007 and all parties held "conferences" during the spring to announce policies. At this time Fine Gael launched a "Contract for a Better Ireland" which was a centrepiece of their campaign. The early conferences led to the campaign being described as one of the longest in recent times. The campaign officially kicked off on the dissolution of the Dáil and the manner of this dissolution, done early on a Sunday morning, led to speculation about the reason for this during the first week of the campaign. The leaking and publication just before the election was called, of evidence about personal finance transactions in December 1994 given to the Mahon Tribunal by the Taoiseach Bertie Ahern led to the first two weeks of the campaign being dominated by questions about his fitness to serve as Taoiseach, and required the Progressive Democrats to decide if they would pull out of Government before the election was held, but they decided to remain. The Tribunal itself decided to postpone sittings during the campaign. Following a statement by the Taoiseach, the remainder of the campaign concentrated on the traditional issues of health, education, crime and the economy, with debate centring on the ability of the various parties to deliver on the various totals of hospital beds, Gardaí and pupil-teacher ratios they were promising. Prime Time hosted a debate among the potential candidates for Tánaiste and a separate debate between Ahern and Enda Kenny coverage of which concentrated on Kenny's ability to serve as Taoiseach given his lack of experience. Finance minister Brian Cowen engaged in some robust exchanges towards the end of the campaign which was reported to have been an asset to the party. Opinion polls during the early stages of the campaign showed the Alliance for Change gaining on the Government and the likelihood of Kenny becoming Taoiseach increased, with some commentators predicting that Fianna Fáil would return with only 65 seats. In the last week of the campaign, following the leaders debate, an Irish Times/MRBI poll showed a recovery for Fianna Fáil to 41% which was replicated on polling day. See Electoral (Amendment) Act 2005 for full details of the constituencies for the 30th Dáil. The preliminary findings from the 2006 Census of Population disclosed that the population of Dublin West, Dublin North and Meath East could have prompted further revisions. The advice of the Attorney-General was sought by the Minister for the Environment, Heritage and Local Government. It was decided to make no further constituency revisions before the election. Two outgoing deputies, however, challenged this decision in the High Court. The election went ahead while the parties awaited the High Court's reserved judgment in this action. The election was considered a success for Fianna Fáil. It returned with a total of 78 seats, three fewer than it won at the previous general election, despite predictions earlier in the campaign that it could lose more than 20 seats. A resurgence in Fine Gael support, which saw the main opposition party increase from 32 to 51 seats. A sharp drop in support for the Progressive Democrats, which saw their seats drop from 8 to 2, including the loss of party leader, Tánaiste and Minister for Justice, Equality and Law Reform Michael McDowell, who immediately retired from politics. The failure of the Labour Party to increase its seat total and had a net loss of 1 seat. The Green Party returned with the same number of seats (6), one gain was offset by another loss. Sinn Féin lost one seat to return 4 TDs, despite predictions of gains due to the return of the power sharing executive in Northern Ireland. Joe Higgins, the leader and sole TD of the Socialist Party lost his seat, leaving them with no Dáil representation. The reduction in the number of independent (non-party) TDs to 5 from 14 in the previous general election. The 2007 election results saw Fine Gael win seats at the expense of the smaller parties and independents. The proportion of votes only increased significantly for Fine Gael, and increased slightly for both the Green Party and Sinn Féin, despite their disappointing seat totals. Negotiations began the following week for the formation of the new government, with Bertie Ahern stating that his preferred option was for a coalition of Fianna Fáil, the Progressive Democrats and like-minded independents. The Fine Gael leader and Leader of the Opposition, Enda Kenny, did not rule out forming an alternative government, stating that he would talk to all parties except Fianna Fáil and Sinn Féin. The election for Taoiseach took place in the Dáil on 14 June 2007 with Bertie Ahern becoming Taoiseach again. †The Ceann Comhairle is a Fianna Fáil member. Fianna Fáil, Green Party and Progressive Democrats majority coalition government formed. The Fathers Rights-Responsibility Party, Immigration Control Platform and Irish Socialist Network were not registered as political parties, so their candidates appeared on ballot papers as "Non-Party". The People Before Profit registered as a political party after the deadline for their party name to appear on ballot papers, so their candidates also appeared as "Non-Party". The total Irish electorate registered as eligible to vote as of 24 February 2007 was 3,110,914. As 2,085,245 first preference votes and invalid votes were cast in the general election this equates to a voter turnout of 67.03%. Outgoing TDs are listed in the constituency they represented in the outgoing Dáil. For Batt O'Keeffe and possibly others, this differs from the constituency they contested in the election. O'Keeffe, who was elected in his largely new constituency of Cork North-West, is listed both as a departing TD from his old constituency of Cork South-Central and a successor TD from Cork North-West. Where more than one change took place in a constituency the concept of successor is an approximation for presentation only. ^ "Greens and PDs to make Ahern Taoiseach again". The Irish Times. 14 June 2007. ^ Article 16.5 of the Constitution of Ireland states that the Dáil may sit for a period of up to seven years from its first meeting. It also allows a shorter period to be fixed by law; this is currently fixed at five years. ^ "Referendum to come before election: Lenihan". RTÉ News. 19 November 2006. ^ "Taoiseach says election set for summer". RTÉ News. 21 December 2006. ^ "Should general elections be held at weekends?". The Irish Times. 2007. ^ "Ahern denies 'prior knowledge'". RTÉ News. 30 April 2007. ^ "Proportional Representation". Irish Citizens Information Board. ^ Article 16.6 of the constitution requires that "provision shall be made by law" such that the Ceann Comhairle "be deemed without any actual election to be elected a member of Dáil Éireann". The current law making such provision is the Electoral Act, 1992. ^ "Preliminary Census report 2006" (PDF). Central Statistics Office. July 2006. Archived from the original (PDF) on 24 March 2009. ^ "Constituencies Constitutional Challenge". McGarr Solicitors. 7 June 2007. ^ Sheahan, Fionnan (15 May 2007). "FF in a nosedive". Irish Independent. ^ Kennedy, Edel (26 May 2007). "McDowell loses and quits politics". Irish Independent. Retrieved 13 February 2016. ^ "Ahern's preferred option is PD deal plus Independents". The Irish Times. 28 May 2007. ^ "30th Dáil general election May, 2007 – Election Results and Transfer of Votes" (PDF). Houses of the Oireachtas. Retrieved 10 March 2009. ^ "Small groups seek to end large parties' dominance". The Irish Times. 19 May 2007. ^ "Oireachtas Electoral Handbook, p. 58" (PDF). Oireachtas Éireann. ^ a b c "Country's longest serving TD to retire from politics". Irish Independent. 22 September 2005. Archived from the original on 2 October 2015. ^ "Sile de Valera to step down as Minister for State today". Irish Independent. 8 December 2006. Archived from the original on 9 March 2007. ^ "Setback for FF as Glennon quits Dáil". Irish Independent. 16 October 2006. Archived from the original on 3 March 2016. ^ "Glennon poll boost as GV Wright opts out of next election". Irish Independent. 17 January 2006. Archived from the original on 9 March 2007. ^ a b "Fox & Mitchell not standing in election". RTÉ News. 24 November 2006. ^ "The four who could scupper Bertie's date with destiny". Irish Independent. 7 January 2006. Archived from the original on 9 March 2007. ^ "Fine Gael and Independent TDs opt out of running in next election". Irish Independent. 25 November 2006. Archived from the original on 9 March 2007.